Performances Birmingham Limited (PBL), the charity that runs Town Hall and Symphony Hall, organises a free jazz gig every Friday. 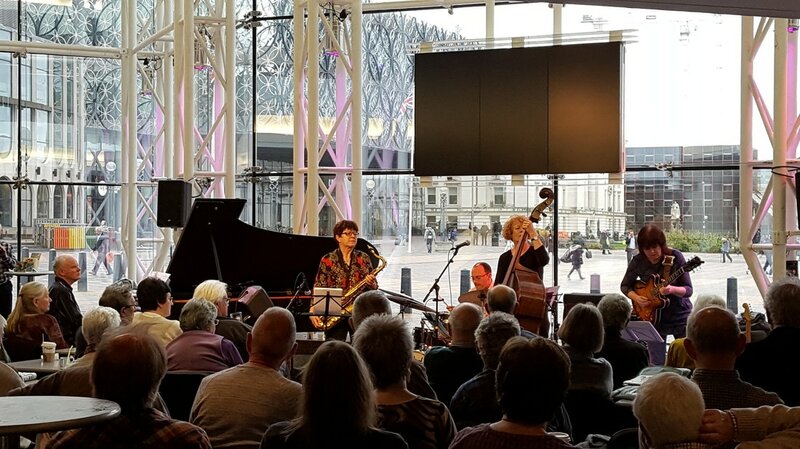 These gigs are usually well attended, but occasionally there is standing room only and, with an audience of 150 or so people, the Alison Rayner Quartet played to one of the biggest audiences I’ve seen there. Hardly anyone gets rich from jazz nowadays, but if the warmth of an audience’s reaction was currency then this group would be very wealthy indeed. At one point, a piece had a false end and the audience began applauding only to be hushed as the group continued. ‘Don’t worry about clapping in the wrong places’, said Rayner, ‘we love it when you clap.’ And this enthusiasm for provoking a strong response from the audience was evident in the smiles of the band members throughout the gig. There was, at times, even some reluctance for pieces to end – rather than a strong finish, several just faded as the applause grew. Rayner personable and engaging compere and proud band leader, smiling at the applause the soloists garnered. Her own solos were succinct and subtle bridges between themes that didn’t get the applause, but drew lots of admiring nods in the audience. The gig focused on the CD ‘A Magic Life’ that came out last year (and was reviewed on JazzViews and discussed in our interview with Alison Rayner). The gig took place in the large foyer of Birmingham’s Symphony Hall, in front of enormous windows, so one might have expected issues with sound quality. However, the sound mix was superb, with a richness in tone and clear separation of each instrument. At the heart of each piece is Rayner’s sonorous bass playing which is complemented by the liquid drum playing of Birch. Cartwright switched between the smooth tones of the Gretsch and tighter, rockier sounds from Fender. Prior to ‘May Day’, she reminded Rayner that Birmingham was the home of heavy metal and duly introduced a nod to the genre with a quote from ‘Smoke on the Water’ (not a Brummie band to be fair, but she was all in purple so I guess this is allowed). Lodder, more than the other players, quoted themes from the CD but built completely different solos that crackled and fizzed in response to the audience and the setting. ‘A Magic Life’ had a collection of pieces that built on memories and, as Rayner said in the introduction to one of those pieces (‘Swanage Bay’), each composition has a story and even if they don’t have words to tell the story the music conveys the essence. Later the group played a piece inspired by her travels in India, where she marvelled at the thrill of seeing elephants in their native habitat. On this piece, Birch played a kanjira, a small tabla-like drum from Southern India, and Lodder thrummed a continued two-note pulse to provide a convincing drone behind the melody. This was a new departure musically and quite a leap from the latin inflections that tinge their earlier work, but promises a interesting line of future work.